This luxury 2 bedroom, 2 bath condo is on the second floor of the Vista Coral Condominiums with great views of the bay (which is full of sea life) and the city lights. It is the only condo project on the water side of the La Paz Malecon. ( a Malecon is a waterfront boulevard and sidewalk) found in only a few cities in the world. The Malecon runs about 4 miles along town and ends at the water park. The advantage here is no car rental needed as it is only a few block walk into the center of town where you will find many restaurants and shops. 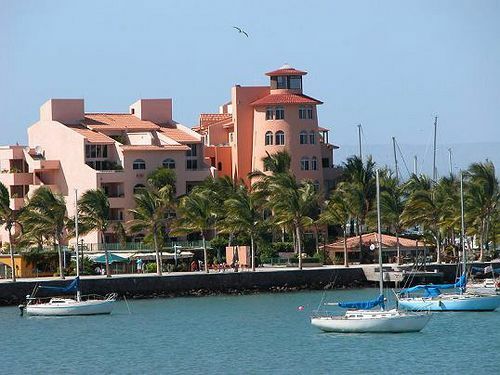 Beter yet, is from the Marina you can take the complimentary water taxi to El Magote for18 holes of golf or engage in world renounced ocean-based activities such as fishing, diving or snorkeing with the whale sharks ( a once in lifetime experience). The new owners of this condo have just refurbished it elegantly with furniture from their stores, CasaDecor, located in La Pz, San Jose, Cabo and Loreto. This spacious condo sleeps 4 comfortably in the 2 bedrooms with queen beds, night stands with reading lamps & full closets. Each bedroom has all marble walk-in showers. The living area has large sectional sofa for viewing 42 inch TV. Dinning table seats 6 comfortably and 3 at the granite bar. The granite kitchen is fully equipped with dishwasher, compactor, disposal, double sink, microwave, as well as all culinary necessities like margarita maker. You also have a washer and dryer in the condo. The deck also has seating for 6 at a marble table and comfortable love seat for sipping your margaritas while viewing the city lights. There are two owner-pools & hot tubs that overlook the bay. The beach in town is lovely, but our guests perfer to go to the beaches north of town for a day's outing. Condo is on the Marina front and the beginning of the Malecon. Walk to the water , Restaurants and shopping. 2 18 hole golf courses within 10 min. Our party of four stayed at this condo for one week in the month of March. It is perfectly located to explore the malecon on foot and access a number of fine restaurants in La Paz. The view of the marina and pool area of the condo was very nice and pleasant. If the owner wishes to continue renting this unit he needs to attend to some important details: When we arrived the laundry of the previous tenant had not been done, the washer and dryer were completely jammed with laundry, completeing someone elses laundry is not a good way to start a stay; the unit was not up to a standard of cleanliness one would expect, it was obvious that a professional cleaner had not been in to clean; the closet in the master bedroom was so full of someones clothing that the couple using the room had no where to put their clothes. After two days a proper coffee maker was brought to the unit by Luis. The biggest issue was four days into the stay sewer gas smells were eminating from the shower in the main bedroom enuite. Luis attempted to fix the problem however to no avail. We covered the drain with plastic wrap and weighted it down with a wet towel to contain the stench. Luis advised that this was an ongoing problem due to the design of the condo system. I requested some compensation for this problem however the owner felt no need. After one month the damage deposit was finally refunded. Would recommend this unit conditional on fixing problems. 1. We had a guest check out at the morning and yes we had professional cleaners come in , they had an earlier that normal check in so we needed to wait for the dryer to run it's cycle. 2. We had an esspresso machine but the guest requested a normal coffee maker so bought a new one and brought it to him. 3. I stayed in the unit 3 days after they checked out and could not smell any sewer gas. Maybe it was a city issue but never have we had that problem. We did send maintenance over to check and he did pour cleaner down the drain. We just had two different clients stay there and sent wonderful thank you emails and one reserved the condo for later in the summer and the other in the Fall. Curt W.Where do you live? We enjoyed a months stay in this condo. We did not rent a car. This is located just steps from the Western end of The Malecon. Perfect location! We walked or took the collectivo buses to the main square, local public market, grocery stores, restaurants and other locations. There is a taxi stand at the entrance to this area as well. We took the Eco-bus from the Malecon bus station to some of the local beaches for day trips. Easy access to vendors to purchase tours to swim with the Whale Sharks or to go Espiritu Santo Island. It is very well furnished with good beds. Kitchen was well equipped - 8 different sizes of whisks! - for example. We would recommend this unit.